The lots shown on this subdivision map are mostly situated between Telegraph Ave. and Adeline St. The northern boundary St. is Menlo St. and the southern boundary street is Alpine St. The other roughly north-south streets in the tract are Calais, Genoe [! ], Harper, Dover, and Shattuck. The other roughly east-west streets are Sutter, Shasta, Sonoma, Plumas, and Tehama. This area in present-day Oakland would be from about 51st St. to 56th St. 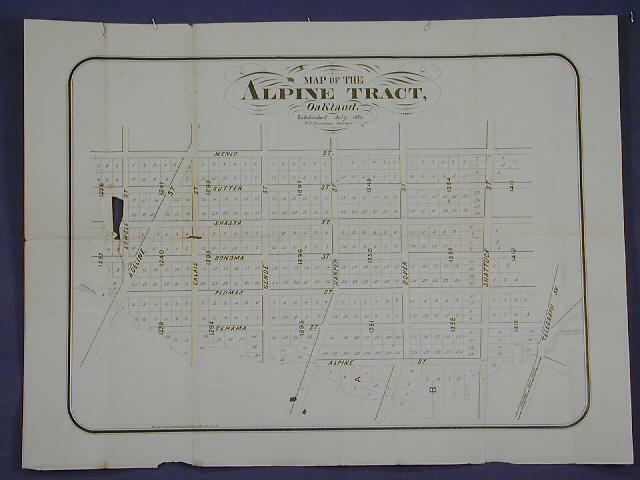 It is stated that the area was subdivided July, 1871 and W.F. Boardman was the surveyor. Temescal Creek appears to be the southern boundary of the subdivision.